Welcome To Our 76th Annual Horse Show and Country Fair! Welcome to the 76th annual Ludwig’s Corner Horse Show! We hope you joined us last year to mark our 75th anniversary when we celebrated what is the rich tradition of this heritage horse show and country fair. As we head into our second seventy-five years, we constantly seek ways to improve the show experience for riders and visitors alike. We welcome our new horse show manager, Doug Curry, who has been our show steward for the past several years and look to an even more efficient and exhibitor-friendly competition. The country fair is being planned to entertain the kids while parents shop in our vendor village. 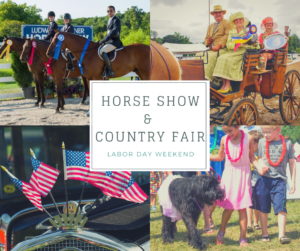 We hope you will mark Labor Day weekend on your competition calendar to join us, at the crossroads, at Ludwig’s Corner Horse Show & Country Fair.